NYCPLAYWRIGHTS: Would you like to promote your show for free on NYCPlaywrights? 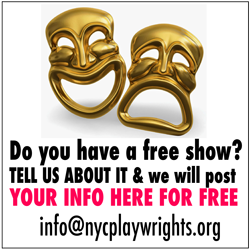 Would you like to promote your show for free on NYCPlaywrights? If you have a free show coming up anywhere in the US, let us know and we'll post it for free. We post NYC-based free shows in the weekly email. Email us at info@nycplaywrights.org with your show's details. More advertising options on NYCPlaywrights.